Palmetto State Armory's PA65 6.5mm Creedmoor Rifle with Vortex Strike Eagle scope. USA –-(Ammoland.com)- See this rifle? It’s going to belong to one of you very soon when we give it away. I like the 15-inch M-Lok handguard – a lot. It's slender, light, and easy to hold. Both upper and lower receivers are 7075-T6 aluminum and are black anodize hard coated to MIL-8625 Type 3 class 2 standards. Up front, there’s a 15-inch PSA M-Lok rail. I like it. It’s lightweight and slender and feels good in the hand. It’s also filled with M-Lok holes at the three, six, and nine o’clock positions and lots of other ventilation cuts to allow rapid barrel cooling. There’s a rail extension on the rear that lengthens the receiver rail and a short rail segment up front in case you want to mount a backup iron sight. The bolt and carrier are Nitride treated for durability, slickness, and easier cleaning. The company also puts dual ejectors in the bolt to facilitate more positive ejection. I’ve not been able to see any observable difference in performance between standard and dual ejectors, but it’s there if you care. The trigger group is made of Nickel Boron treated steel so it's lighter and smoother than standard mil-spec. It's about a $100 upgrade separately. This rifle includes Palmetto’s Nickel Boron trigger group. Naturally smoother and slicker than regular steel components, the trigger is crisper and a bit lighter than a standard mil-spec model. Its two-stage operation has a short take-up with just over a pound of pressure followed by short and constant travel that breaks with right around four (4) pounds of pressure. I could classify this trigger as somewhere between a mil-spec and match trigger. It’s a noticeable improvement over mil-spec but still has enough weight and take-up for safe service and defensive use. There's a short rail segment on the front of the handguard for back-up iron sights on the Palmetto State Armory PA-65 AR-10 6.5mm Creedmoor Rifle. The rifle includes a 20-round P-Mag, Magpul MOE pistol grip, and Magpul MOE Stock. The pistol grip is black and features the MOE grip surfacing. You can use Magpul Storage Core gear in there to carry spare stuff or some emergency beef jerky if you like. The MOE Stock sports a nice and fat comb area for a good cheek weld, dual water-resistant compartment for spare batteries, parts, or snacks, and sling swivel and loop attachment points. It also has a rubber buttpad so when you lean your rifle against the wall; it won’t go sliding out from under you. You'll also get a Magpul MOE buttstock and pistol grip with this rifle. If you’re the lucky winner, I wanted you to know in some detail what you’re getting, so I set up a chronograph 15 feet from the muzzle and proceeded to shoot lots of ammo. OK, so maybe I didn’t really have to, but it was a great excuse to spend some quality time with this rifle. I tested this PA 65 with a variety of 6.5mm Creedmoor match ammo. On the day I tested velocity, it was somewhat warm here in the Lowcountry of South Carolina at 85 degrees. We’re also barely 20 feet above sea level, at least at the range where I was shooting. If you live at a higher altitude or will be shooting in colder conditions, your velocity may clock in a bit different than the results shown here. Also, I fired multiple shots and calculated averages to get the numbers shown below. As the trigger is more of a service model than a target trigger, and because it has a four-pound weight, I elected to fire 100-yard groups with a best five of six model. I figured that the extra shot would help rule out shooter error. With careful shooting, I got good 100-yard groups with this rifle. The Hornady 140-grain Match ELD performed exceptionally well compared to others. I did try something a bit unusual because I just happened to have five hand-loaded rounds tipped with Hornady 140-grain Match ELD bullets. I initially loaded these for a bolt gun, so the overall length is a bit long for AR-10 magazines. That doesn’t mean you can’t shoot them in the Palmetto State Armory PA65. You just have to load them singly through the ejection port. As you’ll see by the group results below, the PA65 seemed to like those slightly longer cartridges quite a bit. Based on this outing compared to the first time I fired groups, the rifle appears to like bullets in the 140-grain range a bit better. While I’ve gotten some respectable groups with the Hornady 147-grain match ammo, they’ve been more erratic. Some of my bolt rifle handholds performed very well, but due to longer overall length, had to be loaded individually. Usually, the rifle alone retails for $799.99 to $1,149.99 depending on Palmetto State Armory’s current deal. However, with a bit of luck, you can get this one for absolutely nothing. Be sure to enter on our giveaway page! Thank you very much for the opportunity to win such an amazing rifle!! 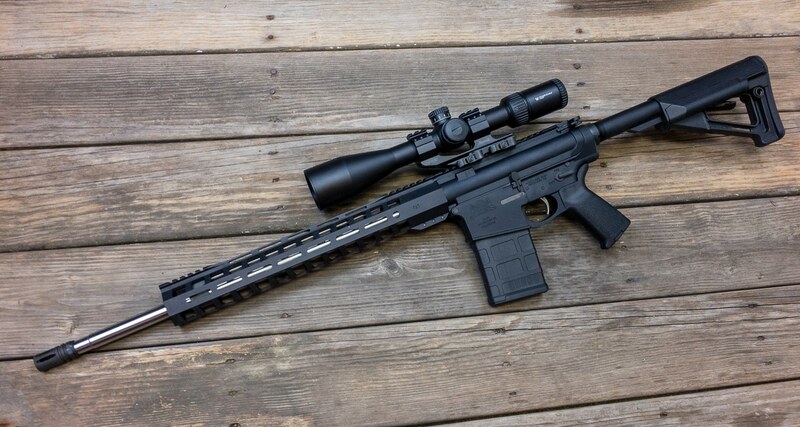 I’ve been trying to pull together the funds to buy an AR10 based rifle, but just isn’t in the cards for me at this time- but I’d definitely be buying some other caliber uppers if I had this rifle to take advantage of the versitility of these great platforms!! Good luck to everyone, but God I’d be super happy to actually won something like this! Thank You for the opportunity. This is a great site, can’t wait to explore it more. Good luck everyone. looks like a fine arm. Bout time to replace my old Marlin 35 cal. Looks like a real class A outfit. I’ve never won anything in my life so expect a big surprise. My luck will turn around one of these days I hope. Beautiful rifle… spent 20 years in the Army and never owned my own rifle. I have 2 sons that want me to buy a rifle and teach them how to shoot. Best of luck to everyone that entered and happy shooting to the one that wins. Best of luck to everyone on WINNING THE… $50 LOTTERY!!!! Because this weapon is MINE!!! Would definitely enjoy winning this rifle and if I did, ROAD TRIP to Texas to, first, visit my daughter and her family. Then second, do some serious ferral hog hunting and donate the meat to a food bank. Win, Win all around! Thanks for the chance to win this fine AR ! I would love to owe this rifle,will look great on the range and my safe rack also. Good luck everyone. Really nice rifle, would like it better if it was in my gun cabinet. What a great prairie dog gun, would love to own one. South Dakota here I come. What a beautiful rifle! Sooo many options! I think it will fit in my safe ! It sounds like a very well built AR . Appears to be, and reads to be a very well built rifle. And built right here in my home state. I admit I’ve never fired a rifle quite this powerful. I am sure I could get accustomed to it if I won it. Some lucky guy or gal will be thrilled to have this rifle in their possession !! Can’t say enough positive good things about this business and their employees. Help a guy save the lap dogs and cats of Southwest lower Michigan! That gun is a coyotes worst nightmare and legal for use on Private land after dark in the smart coyote state. Just entered, hoping, but wishing everyone the best of luck. And if you win and I don’t, you have my undying envy. Looks like a fine setup. Would love to win it. Palmetto State Armory is a great source building your own rifles. Great people to work with and great service. Sounds like a hell of a nice rifle— better if I win it!!!! From the aloha state one beautiful arm to have in the bug out hour.